The following text was kindly sent to me by Mr. Harvey Olsen, Chicago, U.S.A. I have not altered the text except for the formatting. SIX-PIN SYSTEMS - Don Leslie adopted Hammond's six-pin tone cabinet wiring in 1940 because it was easier to connect 30A Leslie Speakers to early Hammond organs. As additional Leslie models were developed for other organs, notably Wurlitzer and Conn, six-pin plugs and sockets were retained. Six conductor cables are interchangeable but the three 6-pin Leslie types are not! Input connections and channeling differ - using an incorrect Leslie type is hazardous plus the speaker will not function properly. Note: "Wurlitzer" and "Conn" brand designations were dropped in later years. These Leslie types are now used with many different organ makes and models including Hammond. FIVE-TO-SIX- PIN HAMMOND SYSTEM - This configuration was originally used to connect Hammond tone cabinets to Hammond Organs. 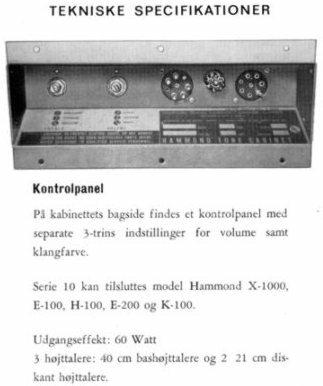 It was also used to "daisy-chain" early Hammond series (21H, 22H, etc.) Leslies together and connect to Hammond-type (6H) Leslie models to later self-powered Hammond consoles with 8000 series connector kits and five-pin sockets at the console. Note: The five-to-six-pin system is not applicable to early Hammond console hookups and Leslie connector kits that require DC (B+) from the tone cabinet for preamp power or motor control. It also cannot be used with Wurlitzer/Universal (6W) or Conn/Two-Channel (6C) Leslie models. HAMMOND SEVEN-PIN SYSTEMS � These are later, multichannel Hammond tone cabinet hookups, and not used for connecting Leslies. However, some Leslie connector kits pick up signal and AC power from the console tone cabinet socket, so they are listed here for reference. Series 10 tone cabinets were Hammond�s last serious attempt to discourage the sale of Leslie Speakers for later multi channel organs. It was mostly unsuccessful, but a number of these cabinets were sold. Series 10 cabinets were originally intended for the H-100 series but later used with E-100s and some spinet models. These cabinets were produced in various finishes and trim to match specific consoles but are identical internally. They are two-channels in with a third bass channel common to both inputs. When used with single channel organs, pins 1 and 7 are paralleled. Series 10 cabinets do not have reverb or other animation, and are not recommended for early or current model Hammonds. NINE PIN SYSTEMS - Nine conductor cables were used with various nine-pin Leslie types including the more popular single and two chan�nel models listed below. However, only the ground (pin 1) and AC input (pins 8 and 9) are consistent in nine-pin Leslie types. Other nine-pin Leslies are multi channel and their pin connections and functions differ. They are not interchange�able with the models listed below and, in most cases, each other. PIN COLOR Models: 760, 770, 825, 825U, 830, 900, 900U, 910, 925, 950, and two-chan�nel models 700 and 710. ELEVEN PIN SYSTEM - All later and current Leslie designs have eleven conductor cables. Current UL, CSA, and other standards no longer allow AC power to supplied from the console so connecting cables supply only signal and control voltages. 11-pin Leslies have separate power cords and are, for most part, electrically interchangeable. PIN COLOR Models: 740 and 750 (typical). Not all pins are connected in Leslie models with fewer channels or features. TWELVE PIN SYSTEM - Only special purpose Leslie models intended for Hammond X-77 and X-77GT organs have 12-pin plugs and sockets. Twelve pin connectors were used with standard nine conductor cables to prevent these Leslies from being used for other applications. They are electrically similar to the multi channel, solid-state, 9-pin models from the 60s and 70s.